So, you ended up with a big, thick, head of coarse and unruly hair. Some people might think complaining about having thick hair is akin to saying you are unhappy with a huge balance in your bank accout. But while thick and coarse hair looks great if it's handled right, knowing how to do that does not come naturally. Some guys just get rid of the whole problem with a buzzcut. But if you don't necessarily want to mow your mop down to stubble, you could use some other, less drastic, solutions. First, it's important to realize that coarse hair is often confused with damaged hair. Often, they're not the same. Coarse hair feels rough, it's dull, and it can grow in different directions. Coarse hair can also tend to be very dry. The upside is that coarse hair is, quite often, very healthy and strong. The downside is that this strong and healthy head of hair can be quite the challenging opponent when trying to tame the beast. One of the most common ways guys damage their hair is by rubbing their head with a towel. When the hair is wet it becomes more susceptible to damage. The hairs get caught in the fibers of the towel and get stretched out and damaged. When drying your hair, pat the hair with a towel instead of rubbing your head. This isn't a quick fix because the hair that is already damaged will need to grow out and be cut off to totally solve the problem. Damaged hair really can't be "fixed," as some products claim. 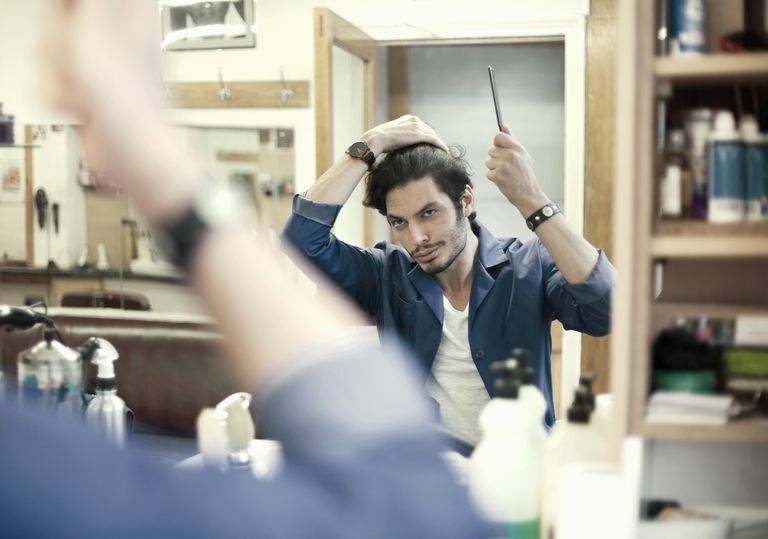 Many barbers and stylists use thinning shears to help reduce the bulk of thick, coarse hair. This is a mistake. Thinning or texturizing coarse hair can make it look even more coarse. Thinning hair can create lots of shorter pieces that can actually hold up the longer hair and contribute to a bushier look. You also don't need to add texture to coarse hair because it already has plenty of texture. Using a quality moisturizing shampoo and conditioner on a daily basis can help soften coarse hair and add moisture if your hair is dry. Two products that are appropriate for this are Paul Mitchell Lavender Mint Moisturizing Shampoo and Paul Mitchell Lavender Mint Moisturizing Conditioner. They're quite effective at nourishing dry, coarse hair. Once per week, you can also try a deep conditioning treatment. One of the biggest challenges if you have coarse hair is fighting the dryness. To help combat this problem, you need a product that helps lock in moisture. A great pomade is almost always a good option to help moisturize hair and add control and shine. Aveda Men's Pure-Formance Liquid Pomade is a good choice. You might also want to try a styling cream with silicone if the pomade is too aggressive for your taste. A nickel-sized dollop of Redken for Men Get Groomed Finishing Cream should work well. Using the right tools can help prevent damage to coarse hair. It's a good idea to style with your fingers or a wide-tooth comb to avoid tugging on the hair and causing damage. Also, stay away from blow-drying because heat can further damage coarse hair, and it also adds volume, and you have plenty of that naturally. Allow your hair to air-dry as often as possible. Keeping your hair trimmed regularly will remove split ends and any damage. Finding a barber or stylist who is skilled with coarse hair is essential and choosing the right haircut—one that works with your hair type—will make the task of working your coarse hair much easier. Some good choices are a haircut with messy texture; a clean, high fade; thick and textured; longer hair brushed back; or a professional, Don Draper style.